CD reviews: "At the Alhambra," "1969 All-Star White House Tribute to Duke Ellington" and "Money Jungle"
Has a centennial celebration ever lasted so long? It was in 1999 that the celebrations marking Duke Ellington's 100th birthday began with an explosion of tributes and reissues and new interpretations of his music. Three years later, new releases continue to come out  including some new material never before released. As the demand for such treasures shows, though, Ellington's influence on American music remains strong even thirty years after his death. Perhaps the best Ellington release in a decade is the never-before-released "At the Alhambra," taken from a 1958 concert in France. Longtime Ellington producer and friend Norman Granz arranged to have the concert recorded, but never released it despite owning Verve Records at the time. The tapes have sat since, and only earlier this year were finally issued on Granz's old Pablo label. But the tapes were in fine condition, and this recording shows the Ellington band of 1958 to be on fire that night. The band still had Ellington stalwarts Johnny Hodges, Harry Carney, Paul Gonsalves, Clark Terry, Ray Nancy and Cat Anderson on board. They tackle both standard Ellington fare  "Things Ain't What They Used to Be," "Take the 'A' Train," "Diminuendo and Crescendo in Blue"  as well as less common songs. A sizzling cover of "All of Me" swings like the Basie band, while "Jam With Sam" is a loosely structured cutting contest. Probably not as good as Ellington's live set from Newport two years earlier, "At the Alhambra" is still a wonderful slice of the Ellington band on the road in front of a crowd. Four years after the Alhambra session, Ellington found himself in the studio with Charles Mingus and Max Roach. 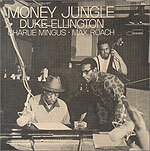 The resulting album, "Money Jungle," long ago entered the realm of jazz myth  held up as a sort of icon proving the old cats like Duke couldn't get their heads around what the young hipsters like Mingus and Roach were doing. Ellington was clearly interested in and intrigued by the new currents swirling around him in the jazz world. Given his lofty standing in jazz, he didn't need to take a chance like this  sitting in with two young lions who were rebelling against much of what he stood for. And yet here he is, noodling around on the piano like a McCoy Tyner or Cecil Taylor. Most interestingly, the songs here all came from Ellington's pen  yet sound as modern and exploratory as anything going on in bop those days. This is one of the best old guard meets the young bucks recordings in jazz history; hearing Ellington interact with Roach and Mingus is magical. It took Nixon to go to China, and also to recognize Duke Ellington's brilliance. In 1969, President Nixon opened the White House to throw a 70th birthday party for Ellington and award him the Medal of Freedom. Best of all, Nixon allowed the tribute concert to be recorded. It's been broadcast to the rest of the world via the Voice of America in the past, but only now is being released in the United States. And about time. It's a wonderful, triumphant combination of high art and sentiment. The White House designated VOA jazz host Willis Conover to assemble the musicians for the tribute, and he outdid himself. The band included such jazz luminaries as Clark Terry, Gerry Mulligan, Paul Desmond, Louis Bellson, Milt Hinton, Hank Jones and Joe Williams. And, whoa, do they cook! Undoubtedly inspired by the presence of Ellington himself in the audience, the band plays more than 25 songs from the Ellington songbook. Some are turned in straight, some are turned inside out. All of them swing like crazy  but especially those with Williams, who honed his chops fronting the Basie Band in the early '50s, on vocals. The set closes out with an impromptu improvisation Ellington created by himself at the piano on the spot, and dedicated to the first lady  a simple but lovely tune called "Pat."